Officials in Washington and Colorado are struggling to come up with new health and safety rules to cover new markets after those states legalized recreational marijuana use. Marijuana may soon become mainstream for adults in Colorado and Washington state, but before it reaches that point, regulators face a tall task: making sure that newly available pot products don’t become a hazard to public health. Months before legal sales of the drug begin, officials in both states are struggling to come up with health and safety rules to govern a menu of marijuana offerings ranging from leafy greens to food and drinks. 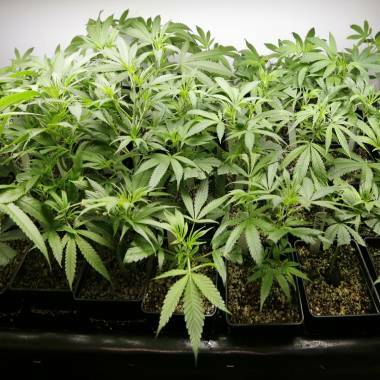 Pot, like other agricultural commodities, could be subject to problems ranging from mold, mites and pesticide residue in the raw plants to solvents, E. coli, salmonella and run-of-the mill food safety risks in prepared products, experts say. Government agencies such as the Food and Drug Administration won’t weigh in because marijuana remains illegal under federal law. That leaves state officials to come up with a framework for policing production and distribution for an entirely new industry. Voters in both states legalized recreational marijuana use for adults last fall. Washington is set to issue producer, processor and retail licenses by Dec. 1; Colorado is set to start sales by January. As it stands now, laws in both states skirt the public health issues of medical pot production. No quality control tests are required; there’s no mechanism for recalling contaminated pot products. And the framework for new rules remains a work in progress. “Currently, there’s really nothing codified,” said Julie Postlethwait, spokeswoman for the Colorado Department of Revenue, which will run a new adult marijuana program. Under that state’s existing law, medical marijuana products were explicitly excluded from state rules governing food and drugs. In Washington state, a burgeoning market for “medibles” -- foods infused with medical marijuana -- has flown almost entirely under any regulatory radar. Producers like Karen Brower, co-owner of Puff n Stuf products, say they’ve taken it upon themselves to make sure that food safety is a top priority. Still, there are no tests for Brower or her partner, Julie Guterson, 54, to take, no inspectors to review her stainless steel sinks or to review the sanitizing cycle of her dishwasher. 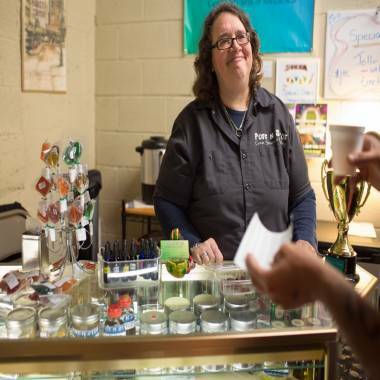 She sees the need for new regulations for the larger recreational pot market, but she’s worried it might create stricter standards that her small operation will be unable to meet. Julie Guterson sells cannabis-infused foods at the Puff n Stuf booth in one of the two locations of the NW Cannabis Market in Seattle. "I'm working out of my home. We have no pets - we tie our hair back and wear clean shirts." Some larger producers, however, didn’t wait for government officials to impose health and safety standards. Tripp Keber, chief executive of Dixie Elixirs & Edibles in Denver, says his multiple product lines of pot-infused mints, candies, snacks and sodas already adhere to federal standards for quality. Keber claims to be the largest tester of medical cannabis in Colorado, sending samples of raw material and finished products to CannLabs Inc., a medical marijuana testing laboratory. Genifer Murray, the lab’s chief executive, says she conducts tests now for potency and for the presence of solvents, but adds that there’s so much more that could be detected. Marijuana is susceptible to pests and to mold, which can pose a health hazard. There have been at least two cases of fungal lung diseases linked to consuming moldy marijuana, according to a 2011 report in the Mediterranean Journal of Hematology and Infectious Diseases. Simmons, the Washington state project leader, says that officials there have done the research they need to create a new system for regulation, one that likely will be modeled on existing state Department of Agriculture food safety regulations. Draft rules are scheduled to be issued in mid-May and refined after public comment. The new standards will have to provide methods not only to detect impurities, but also to confirm the strength of the active ingredients. Plus, they will need to provide rules for reflecting those findings on the labels, experts say. With testing and quality control in place, the available marijuana may become even more attractive to consumers seeking the assurance of regulation, said Mark Kleiman, a professor of public policy at the University of California, Los Angeles, who is advising Washington about its new law. “The commercial system will be able to compete with the medical market and the illicit market if it offers not only legality, but a product of known content and an absence of harmful contaminants,” he said. The prospect of an expanded adult marijuana market also leaves advocates eager for mandatory testing – and new certification for the labs that do it. That view is shared by Randy Oliver, chief scientist at Analytical 360, a Seattle laboratory that tests marijuana. He’s seen his share of insects, mites and powdery mold on improperly tended marijuana.